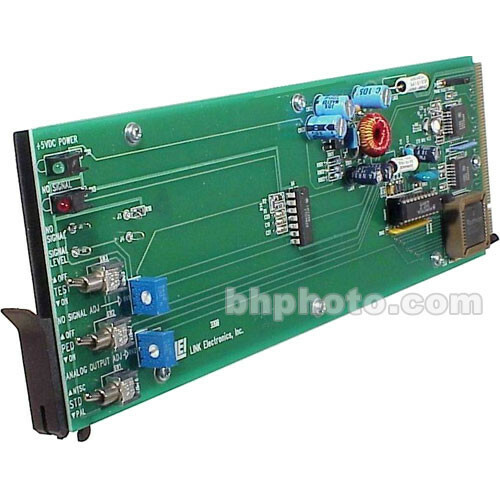 The Link Electronics 11781078 is an SDI video distribution amplifier and D to A converter; it fits into a rack frame for space saving convenience and features automatic equalization and reclocking allowing for a very clean signal path. This model features conversion to composite video with analog DA capabilities. This Converter/DA operates in a rack frame able to accept 9 or 10 more modules of analog or digital capabilities. This allows the user multiple capabilities in a small studio rack space. Automatic equalization and reclocking allows for accurate signal processing with different length cable runs with SDI outputs. Front edge indicator LEDs light when signal is below a specific preset level; the preset level can be adjusted to a specific point. A rear edge fault indicator is offered for engineering usage. An output level adjustment for analog allows levels from 600 mv to 1100 mv to be selected. This device converts into NTSC or PAL analog video. Analog video can be processed to output 4 composite or two Y/C (S-Video); it can also mix formats and output 2 composite and 1 Y/C video.